Teak, grown in Indonesian countries, is a strong hard wood with an oily feel. The color ranges from reddish golden brown to a rich brown with dark markings. 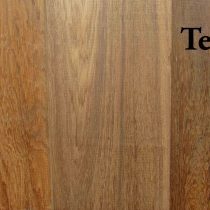 Because of teak’s hardness, resistance to termites and natural oils, it is used for outdoor furniture, flooring and boat building. S4S means this hardwood has been surfaced on all four sides. This board has a cleaner appearance than S2S1E. Available in 4/4 or 6/4 thickness, 1-1/2″, to 6-1/2″ wide, and 3′ to 8′ long.